The beautiful Annette Gortz Venus trousers are a worthwhile investment for your everyday wardrobe, providing a distinctive look with their modern details. With a classic button and zip fly fastening and four pocket style, these stretch skinny trousers offer a flattering fit and a contemporary stepped hem finish to the ankle. The trousers also feature black velvet text down both legs that quotes iconic Irish poet and playwright Oscar Wilde, reading: "The ordinary gives the world its existence, the extraordinary its value." 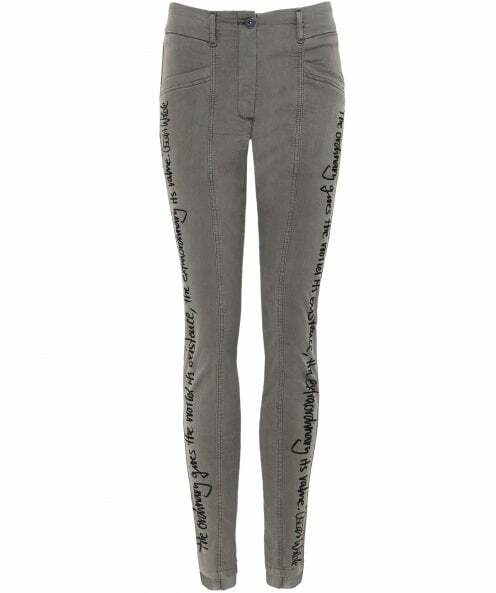 Pair your Annette Gortz trousers with a slouchy knit and ankle boots.